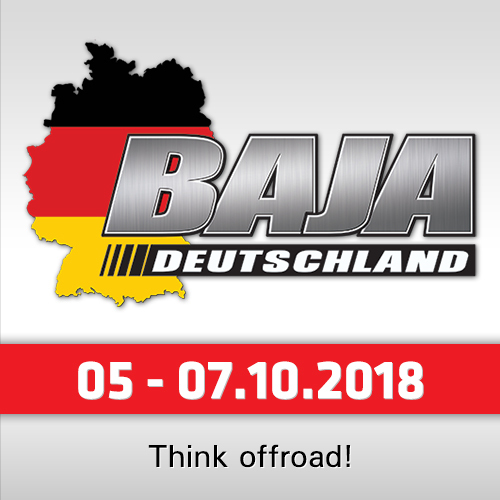 To the start of SS10, 30 trucks from 44 stay in the race. Not a bad statistics, considering that in other categories the percentage of left vehicles is higher. From 92 cars applied to the rally, only 54 started stage Salta – Belen, from 139 motorbikes – 92, from 49 quads – 36. 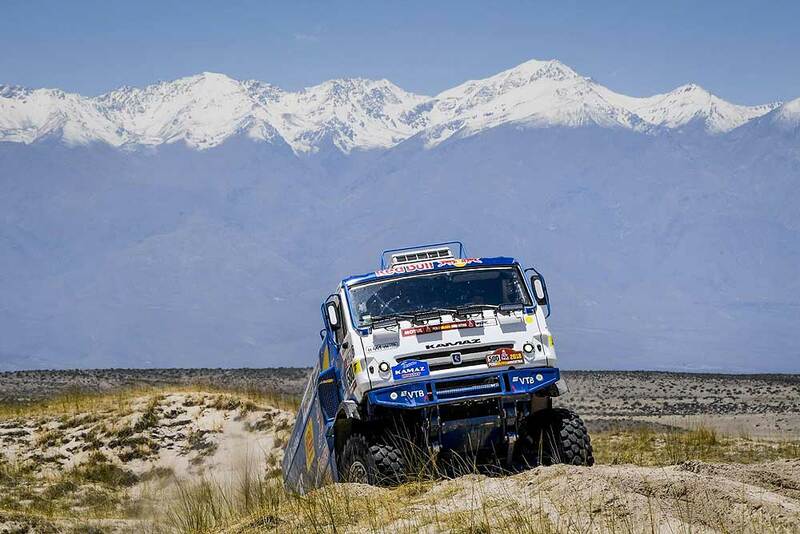 Catamarca is traditionally unfortunate region for Kamaz-Master. There two years ago Eduard Nikolaev’s truck fell on its side and Mardeev’s crew was stuck in the sand. 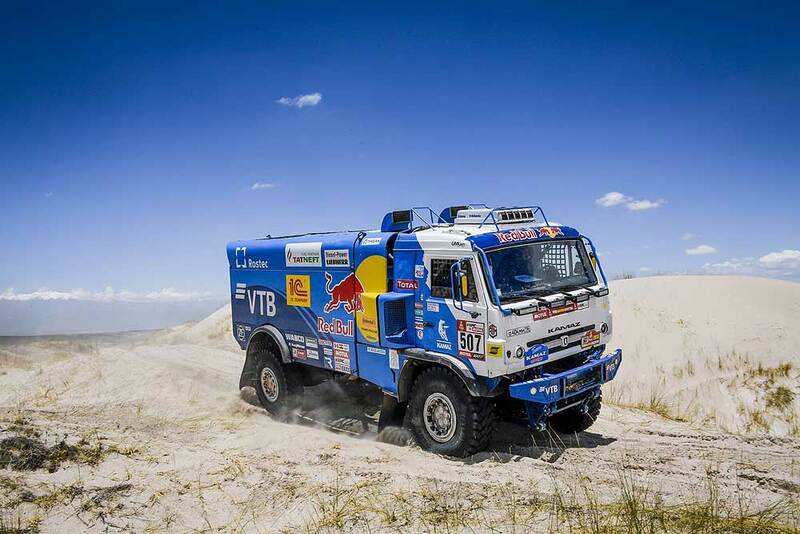 Tuesday’s stage did not become an exception – the breakdown of front reduction unit on Nikolaev’s truck, Airat Mardeev’s loss of time for a wheel change and fire of Anton Shibalov’s truck - that is an incomplete list of the misfortune. Almost from the very start of the special fans were worried by monitoring the timing of Eduard Nikolaev on the special section. 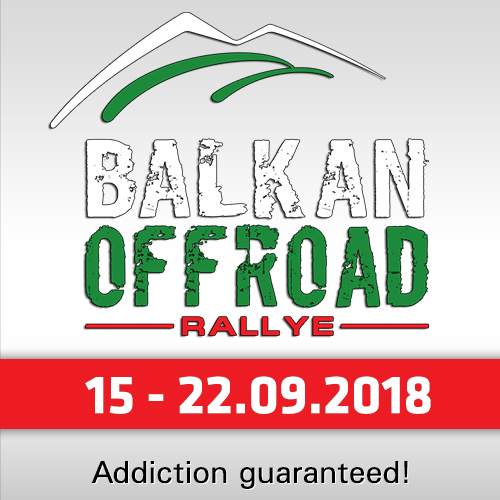 The breakdown of the front axle reduction unit, punctures of two wheels on the first half of the route and driving out of a dried-up river-bed in the second part of the stage – all that resulted in time loss of approximately twenty minutes. "There are no easy Dakars," said Nikolaev after the stage. "I ascertain it once again. I thought that falling on the side on SS05 was the main challenge. But in fact it was not. Tuesday we had a very serious breakdown of the front reduction unit and at some moment I thought that Dakar for our crew was over. Fortunately, our mechanic Vladimir Rybakov suggested to turn on the front inter-wheel lock, as it can save the reduction unit from the final failure. It really helped, though with the turned on inter-wheel lock, the speed was different." "We drove in accordance with sounds. We had to listen to transmission in order not to overload it. The truck did not get into turns. We touched two stones by wheels. Dmitry Sotnikov’s crew helped us. Many thanks to them. The second SS was more sandy. It was beneficial for us– lock gears did not “suffer” much. It was difficult to steer. Arms became “clogged”. While the rivals are very strong. I think that Villagra excels Gerard De Rooy in some areas, he is a very strong rival." Airat Mardeev’s crew punctured front left wheel. Its change in an uncomfortable place took them 17 minutes. Two generators that broke down one by one also did not “contribute” to a good speed of the crew on the route. The crew had to switch off lights and fans in the cab. Vladimir Chagin said that he knew from his own experience what it was like to go in such a heat without fans, with salty sweat pouring into your eyes. "A long and tiring day," reported Mardeev. "A lot of impassibility. Iveco team goes very fast. Frankly speaking, I did not expect it from Villagra, and especially from Genugten. It was seen that in many places he risked. But his truck keeps till the finish. It was difficult to fight with him. We punctured a wheel on the first half. It took us long to change it." "The soil was very soft, we had to take two jacks, tracks, so that jacks would not go down under the ground. We even stopped Anton Shibalov’s crew. His crew helped us. The generator “finished”. We drove without charging, turned off all fans, light. On neutralization zone guys quickly changed the generator. We drove further. But as we started, the generator went out of order again. Again we drove without fans and light. There were a lot of fast sections, a lot of impassibility, we were all wet. Moreover, it started to get dark. Realizing that impassibility was our chance, we tried to attack till the end." It is a terrible challenge. But for these problems Mardeev could greatly improve his position in the general standings, moreover that the Czech Martin Macik lost about 40 minutes. 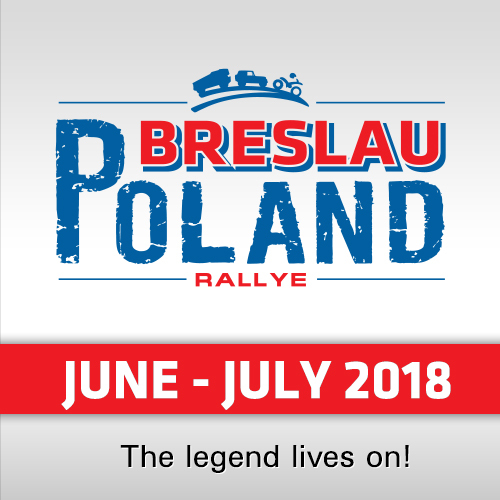 But the third position after SS10 stage was taken by stable and fast Belorussian Siarhei Viazovich (MAZ), contesting with crews of Airat Mardeev and Ton Van Genugten (IVECO) for the right to be in top-3. Federico Villagra, the main rival of Eduard Nikolaev, keeping the lead in the general standings, already in Tupiza regretted cancellation of stage Tupiza-Salta. The Argentinean tries to use every special to cut the gap from the Russian. "For me it will be easier to do in my native Argentina," - makes no secret Villagra, and already in Catamarca starts to prove it, not saying about native Cordoba, where as a repeated winner of a national classical rally championship he knows every hillock on the track.